To register, carefully follow the instructions below. You will be re-directed back to our website after submitting payment to complete the mandatory NFL registration. Complete the mandatory ​​​​registration form and liability waiver below and make sure to hit the blue "submit" button located inside the bottom of the form. Click the green button at the bottom of the page to ​submit payment using PayPal or a major credit card. You will be re-directed back to our website once your payment is complete. Register your child with the NFL. To review instructions on how to register with the NFL, click here . Players can NOT participate until they are registered with NFL and we have a full payment. 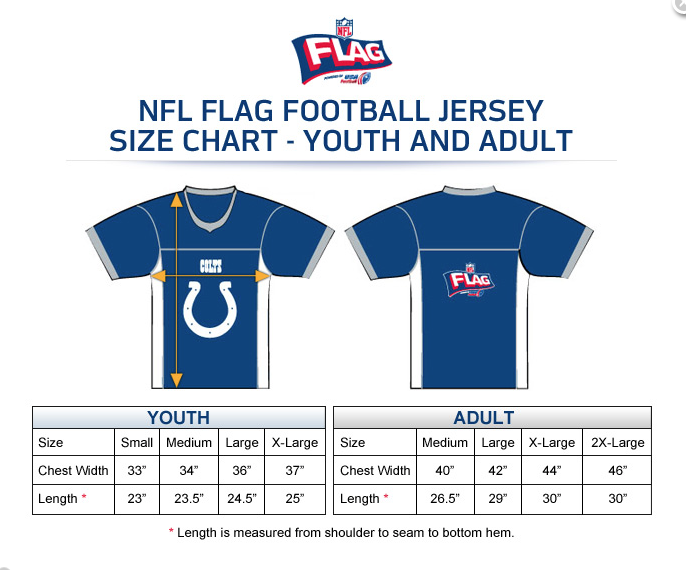 To view an NFL Jersey SIZE CHART, click here . Jerseys cannot be returned, or exchanged, so select your child's size carefully. Jerseys run very small. There is an additional jersey replacement fee of $45 + shipping. ​If you experience difficulty registering, please contact us for assistance. NOTE: Our registration form will NOT work with older browser versions including: Chrome 23, Firefox 23, Internet Explorer 9, or on a smart phone. If you cannot view or use the form below, please update your browser, or contact us for assistance. Fill in all the blanks on the form below and ​​make sure to click the blue "submit" button. Next, scroll down to the bottom of the page and click for Step 2. ​​DO NOT go to Step 2 without clicking the BLUE "SUBMIT" BUTTON ABOVE. Your child is not registered until you submit this form and liability waiver. Then, click the green button below to continue the registration.